Pinterest crossed my path this evening. It took all of 30 seconds to realise that it will solve my problem of how to send out and manage communications! Instead of sending out emails every week with news relevant to specific audiences; we now have boards with topics where great articles and tutorials on SharePoint and various subjects are posted and will be added to regularly. Mine is brand new and hot off the press. I invite you to stay in touch with one or all of them. Just click in the box to see the articles, and follow / like them accordingly. If you hover over an image, you’ll see a Like button appear at the top in the middle. You can also comment on stuff. Very groovy. Or sign up and start your own! It’s really is super easy. 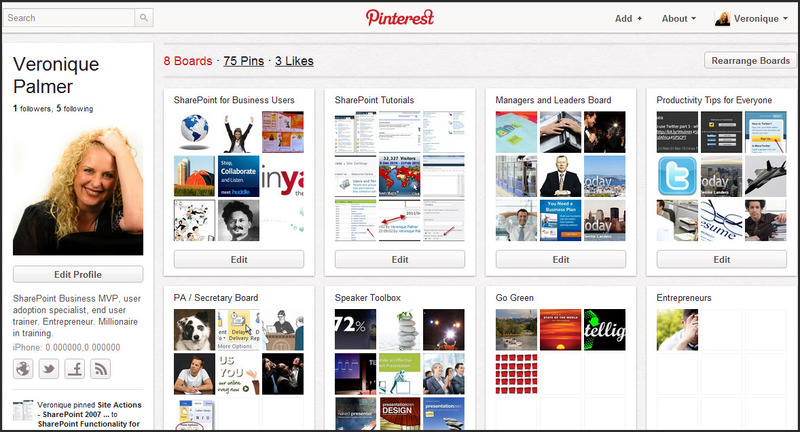 Wanna make sure people can pin your website / blog to their boards? Make sure you have big images and / or video in it. Email is out, Pinterest is in. 🙂 11 million users are on to something.